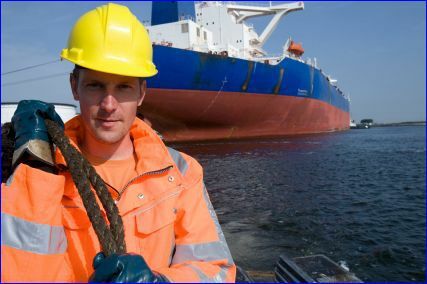 If a maritime worker is injured on the job in Washington state, there are a number of legal remedies available that may allow the injured victim to be compensated for losses they have suffered as a result. Maritime employees who work on vessels of the State Department of Transportation have two possible courses of action in the event of injuries incurred or made manifest while in duty of the vessel. One is through the state’s industrial insurance act or worker’s compensation laws. The other is through the federal Jones Act, also referred to as General Maritime Law. By transitioning from the Jones Act to the Industrial Insurance Act for Washington State Ferries employees, employees would lose the opportunity for overall larger benefits for serious injuries that have negligent or unseaworthiness components, but they would gain a more predictable and long term system of no fault benefits. The eleventh amendment to the United States Constitution grants states sovereignty from being sued, unless they consent to it by waiving this right to immunity. For states that have not waived their eleventh amendment rights, maritime employees cannot sue the state, and their course of action is through the state’s industrial insurance act or other worker’s compensation laws. For Washington and other states that have waived their eleventh amendment rights, maritime employees can sue the state, and their course of action is through the Federal Jones Act. 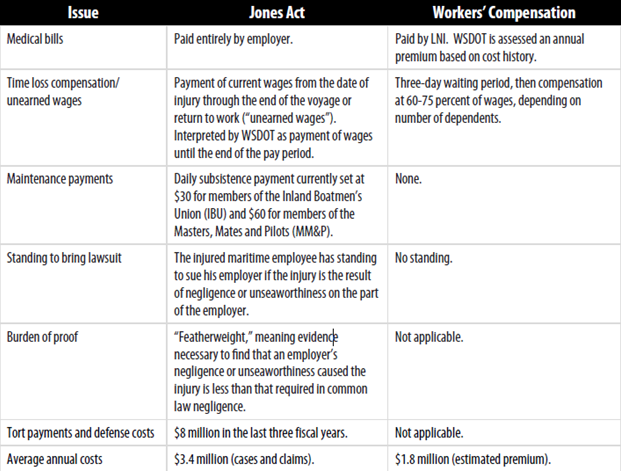 In Washington state, 60 percent of Washington State Ferries (WSF) employees are covered by the Jones Act, while the other 40% are covered by the Washington Industrial Insurance Act. Under the Jones Act, an employee can recover benefits for two types of injuries. The first is if the employee becomes injured during work on the vessel. The second is if an injury becomes manifest while in duty of the vessel, but was not necessarily a work-related injury. The Industrial Insurance Act allows recovery for only the first type of benefit. Benefits can only be obtained for occupational injuries or illnesses; no such benefit exists for injuries or illnesses that become manifest while on the ship that are not work related. Under the Jones Act, there are three types of no-fault benefits that employees are eligible for. The first is called cure. This is payment of medical treatment until person reaches maximum medical improvement. The second is called maintenance. This is a daily stipend that the person receives until they reach maximum medical improvement, and is not subject to income or payroll tax. The third is unearned wages at 100% of salary through the end of their pay period. Unearned wage payment is subject to income and payroll taxes. Injuries covered by the Industrial Insurance Act are paid at 60-75% of salary after the first three days off work. Unearned wages are only given for the first three days if the employee cannot work for more than 13 days. This compensation is not subject to income or payroll taxes. Under the Industrial Insurance Act, no fault benefits are more extensive and long term than the Jones Act. Under the Jones Act, there are two causes for filing a lawsuit. If an employee can show negligence on behalf of the employer, they can file a lawsuit. The burden of proof is “featherweight” in these cases, meaning that the burden is less than in standard legal cases. If they can show unseaworthiness of the vessel, they can also file a lawsuit. The unseaworthiness of the vessel must only be the “proximate cause” of the injury in order to file a lawsuit. Because one can file a lawsuit, the combined benefits may be larger under the Jones Act. It takes an average of 31 months to settle lawsuits, so the injured party might have no income in between reaching maximum medical improvement and settling the lawsuit if they are unable to return to work. Under both systems, employees receive help to find another WSDOT position if they are unable to return to their job. If an employee has reached maximum medical improvement and is unable to return to work in any capacity in the WSDOT, no fault benefits are terminated under the Jones Act. Under the Industrial Insurance Act, employees who are unable to return to work receive a vocational training plan which could include school or on the job training. No-fault benefits continue during this period. The Jones Act provides for very limited long term benefits. There are no disability awards, pension, or survivor benefits. The only benefits permanently injured individuals receive is the state’s basic long term disability benefits of up to $240 per month. The Industrial Insurance Act provides for many long term benefits. Individuals may also receive the state’s basic long term disability benefits, but additionally they may receive partial permanent disability awards and permanent disability pensions. If you or a loved one is a maritime worker who was injured on the job in Washington state and would like to learn more about your legal rights and options, contact us today via the form on this page or call 206-727-4000. We offer free legal consultations to accident victims and work on a contingency fee basis, which means you don't pay anything until your case is resolved.